Once the domain of the farming community, it has now become very popular for families to keep a few chickens in their backyard. They are great companions for children as well as converting food scraps to eggs and manure for the garden. Whilst they are fairly easy pets to keep there are a few basic health care needs that you should consider if you are planning on keeping a few chooks in your backyard. What type of birds should I get? If you have a small garden or young children then bantams are an ideal choice. These birds are smaller than most hens but still produce a good number of small sized eggs. Cross-breds are the best backyard hens if you want a ready supply of eggs and a long life-span. Examples include New Hampshire crossed with either Isa Browns or Australorps. Specialist breeds may be available from show breeders. Buying birds as “point of lay” pullets is the best choice for novices. 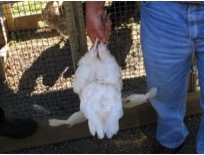 These birds are usually 16-20 weeks old and start to lay 4-6 weeks after you buy them. Another common way to buy birds is “retired” commercial layers. These hens may look a bit scruffy at first but quickly adapt to their new environment and still have a few years of laying left in them. Ideally you should try to source vaccinated birds from reputable commercial breeders. If you already have other hens then you should quarantine your new birds for about 6 weeks before introducing them to avoid disease outbreak. 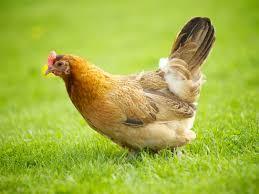 Warrnambool City Council allows you to keep up to 10 hens but no roosters in your backyard. How do I house them? Chickens need protection from the elements as well as predators. If you have cats or dogs then they should have a dedicated area that is fenced off away from other pets. Foxes and feral cats are a problem at night in town, as well as on farms so make sure your shelter is predator proof. You can buy pre-fabricated chicken coops that can be moved around your garden on a regular basis to provide fresh grass or you can build a permanent shelter with a fenced off area for the chickens to scratch around in the dirt. 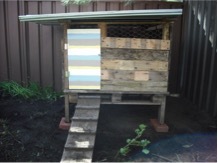 The chook house should provide enough space for them to stretch and flap their wings and provide a sheltered nesting box in which to lay eggs. You will need one nest per 4 birds about 30cmx30cm in size. You can line their nests with straw or even shredded paper. The coop should be well ventilated to reduce respiratory disease with an open (but meshed) side facing north east. There should be a perch for them to roost on at night with 18-25cm per bird and be no more than 30cm off the ground. Don’t put it above their food or water! Providing a deep litter bed in their run will reduce dust and mud – examples are pea straw or wood shavings – lay this out over the ground and when they have scratched it up after a few weeks it can be used as mulch in the garden or composted. This makes it easy to remove faecal contamination from their environment and reduce disease exposure. Remember they eat small insects too so can be used to scratch around fruit trees providing pest control and fertilisation. If you don’t have pets that will hassle them, allow your chooks to free range in your garden. A balanced diet is essential to keep your birds healthy. Young pullets or chicks will need a specialised diet that is high in protein whilst they grow. When they reach the point of lay (at about 16 weeks) they can be changed to a layer pellet. Most rural farm stores have a range of pelletised feed available. You can purchase many types of feeders but the best ones are vermin proof so that most of the feed you buy goes to your chooks and not the resident sparrows! A layer will eat an average of 1kg feed a week. Chooks don’t have teeth (hence the saying “rare as hen’s teeth”) so they need a ready supply of grit to allow them to grind roughage in their gizzards. You can buy shell grit at pet stores or supermarkets. Their pellets can be supplemented with kitchen scraps. They will eat most things but often leave fruit skins which can become smelly in their coop. As a rough guide if you would consider eating it then they will too! Avoid feeding noxious weeds or poisonous plants such as rhubarb leaves or mouldy food. They need a constant supply of clean drinking water. Fresh water should be provided every day and should be kept away from their bedding so it doesn’t get wet. Feed and water containers should be washed and disinfected weekly. What diseases do I need to worry about? If you buy your birds from a commercial breeder they should be vaccinated already against the many major pathogens including Marek’s and Newcastle disease.Vaccines are only available in bulk so can be inconvenient to do in small flocks. Parasitic disease is the biggest concern for backyard poultry. Internal infestations with worms are the most common, causing weight loss or death if they suffer a very heavy infestation. Poultry wormers are available at pet stores and veterinary clinics and can be added to their water every 12 weeks. Make sure the wormer you buy is suitable to use in laying chickens. You must follow any “withhold” periods if they are listed on the bottle, this means you can’t eat the eggs or meat for that period of time. If you continue to have a problem a vet can examine the faeces to identify the type of worms present and recommend specific therapy. External parasites include lice and mites that live either on the bird or in its environment. Scaly leg mite for example will cause thickening to the skin on their feet. Cleaning the coop out and using a mite powder on the environment will help to control mite infestation. If birds are severely affected a vet may use other products “off label” under their supervision. You can check your birds are in good health by picking them up and feeling their keel or “breast bone” to make sure they are in good condition. There should be good muscle cover over the keel, if it is too bony she is too thin. How to catch and hold a bird. Pen the bird in a confined space first. Birds are quiet and easy to manage in low light conditions (eg dusk). Approach the bird quietly and make slow deliberate movements that block escape. Grasp the wings to the body by moving your hands down over the top of the bird. Then grasp the legs in one hand while continuing to hold a wing to the body with the other. Support the bird’s body with the hand holding the legs and when it has settled, the bird should be easy to inspect as required. Whilst this looks odd, hanging a chook upside down is the best way to calm them and be able to examine them! Chickens can be infected with several roundworm species and a tapeworm. Worms lay eggs inside the gastrointestinal tract of the chicken and then shed the eggs into the environment via their faeces. Many of these worms use an intermediate host (such as an earthworm or snail) to transport their eggs in the environment. Most backyard chooks are “free-range” and as such will have access to fresh soil and faeces and so can be readily infected with worms. If your chickens are thin and have soft, watery faeces then they could be suffering from a heavy worm burden. A veterinarian can examine a fresh sample of faeces to see if there are worm eggs present to confirm this. Low worm burdens cause few problems in backyard chickens. You can prevent worms becoming a problem in your flock by removing faeces from their pen and roosting area weekly. You should routinely worm your chickens 2-4 times a year. Roundworms are easily treated with medication that can be placed in the drinking water. 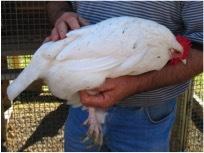 Warrnambool Veterinary can provide you with appropriate worming products suitable for egg laying chooks. It is important to get professional advice before using any medications as not all are suitable for use in birds that are laying eggs or are for human consumption. You need to check the label for the “egg withholding period” for the product you are using and not eat any eggs produced in this period after treatment. If your chickens have a tapeworm infection you will have to use a product that will have an egg withholding period and you should seek advice from your vet. Further information If you have any further questions about keeping backyard chooks feel free to contact Warrnambool Veterinary. For more information or alternatively you can look at the following websites for more factsheets.